Just when you think you’ve got online ranking systems all figured out, a new metric pops up to throw a wrench in the works. And while you could continue adding to your workload by trying to keep track of and influence every new metric on the market, the truth is that most businesses lack the time, the money, or the inclination to take this course. That said, there are two major metrics that seem to be duking it out for dominance at the moment: Google’s Page Rank and Moz’s Domain Authority. And both may be employed by savvy businesses to determine how their online efforts are affecting their standing with search engines, as well as glean clues as to how they might proceed in order to achieve more success with search engine optimization. But is one metric better than the other? How can you tell which one will offer your business the best information and insights? And which looks to remain relevant moving into the future? Let’s start by examining how each metric is calculated and what they mean for your website. Google Page Rank (or PR) is an algorithm that tracks specific data in order to calculate a numerical weight that basically determines how your website stacks up when compared to others of its kind. The program calculates this number (a percentage that translates into a page rank on a scale of 1-10) by analyzing links and compiling statistics that have assigned numeric values known only to Google. The Page Rank for your site is based on all kinds of factors that influence the numbers assigned to you, but the main factor is the number and value of inbound links, which is to say, hyperlinks that lead to your website. The algorithm is extremely complex in how it assigns values, which is probably why Google has managed to retain complete control of it. That said, it is generally understood that securing links with reputable and highly ranked websites is one of the best ways to boost your own rankings. A site that attains PR8, for example, is given more weight in its endorsement (via a link to your site) than one that has a value of PR2. Of course, factors like traffic and quality of content may also play a role in your overall page rank, especially with the current algorithm. So it doesn’t do to rely solely on links to raise your PR. Keep in mind that Google is bound and determined to ensure that a site or page that gets top ranking for a particular search actually provides their users with the quality of content that elicits this honor. When you’re trying to raise your page rank, ignoring this fact and engaging in black hat SEO practices could actually get you de-listed and send you back to square one. And let’s be honest: if you’re not ranked on Google your online business is missing out on a ton of potential exposure. So what about Domain Authority (DA)? How does this popular, newer metric factor in and why should you consider using it at the expense of PR? For starters, the goal of DA is a little different than PR. Whereas Google’s Page Rank algorithm actually determines your ranking for specific searches and has the power to affect your standings and ultimately, whether or not you’re found by the users that are searching for you, DA is geared towards looking at a number of other factors in order to give you a snapshot of how your website will perform when it comes to search engine rankings. Perhaps the best way to put it is to say that Google Page Rank is catering to their users, i.e. those who enter search queries with their site, while Domain Authority is interested in serving the needs of websites looking to monitor and analyze their standings in order to increase their relative popularity. With such divergent goals it’s not hard to see why these metrics are so different, and why businesses might be more interested in utilizing DA. Domain Authority calculates “rankings” on a scale of 1 to 100 that is logarithmic, which means that the higher you score, the more difficult it gets to continue advancing. So going from 10 to 20 is a lot easier that jumping from 60 to 70, for example. And your score will tell you how you currently stack up when it comes to what search engines are looking for, based to some degree on factors that appear to influence Google’s algorithms. It takes into account more than forty different factors in the course of calculations, including traffic, links (both inbound and outbound), your current Google page rank, your Alexa ranking, the age of your site, the number of pages you have, and more. And what you’re probably wondering now is what bearing this has on the success of your website and why you want to use the metrics offered by Moz. 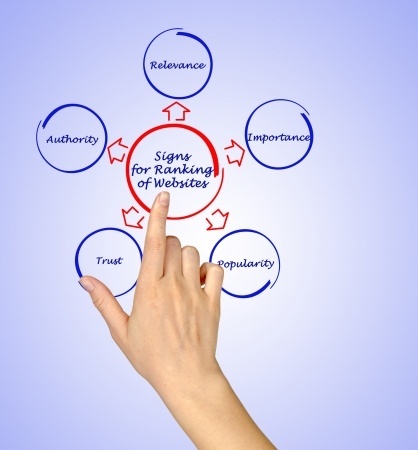 Why Has Domain Authority Gained So Much Popularity? Now we get to the meat of the matter. And the reason that DA has become so popular over the last couple of years is probably because of the analytic options they offer. Whereas Google is pretty tight-lipped about how Page Rank is calculated, making it difficult for business websites to figure out ways to improve their standing, Moz has offered a metric that people can actually use to see where they’re falling short and to track their efforts to increase their potential search engine rankings. The problem is that you cannot escape Google’s dominance in the online search market. As much as we all hate kowtowing to Google, Page Rank is pivotal in determining the success or failure of websites, and since you definitely want to take advantage of the fact that they hold sway over roughly two-thirds of the search traffic on the web, you cannot afford to discount the importance of PR when it comes to search engine optimization. So Which Metric Matters Most? The ideal choice, then, is to use Page Rank and Domain Authority in concert since both can play a role in how you choose to manage your online operations and whether or not you reach your goals. Although DA can give you the information that helps you to formulate strategies for your SEO efforts moving forward, it cannot provide you with the actual rankings that ensure you are found by prospective customers seeking what you have to offer. DA can help you decide if you need to work on your inbound links, engage in guest posting on high domain authority sites, or create more pages of original content for your site. And it can give you another view of how you stack up to competitors, as well as how potential advertisers and link-seekers may see you. But PR is still your primary source for getting targeted visitors in the door, and ultimately, this is what will net you sales. So find a way to use them both and you’re bound to see improvement all around where your online efforts are concerned. Good article Sarah. I just wish you made more of a distinction between true PR and toolbar PR, which is what we (non employees of Google) have access to. This article elaborates a little more: http://seo-website-designer.com/Google-Toolbar-PageRank My point is that Domain Authority is way more useful since toolbar PR isn’t “real” PR. It’s like flushing your effort and time down the commode to use toolbar PR and delight in the illusion that it’s real PR — it’s not. Thank you for your comment Alex and thank you for providing the link!